Saul Williams, originally uploaded by alister. 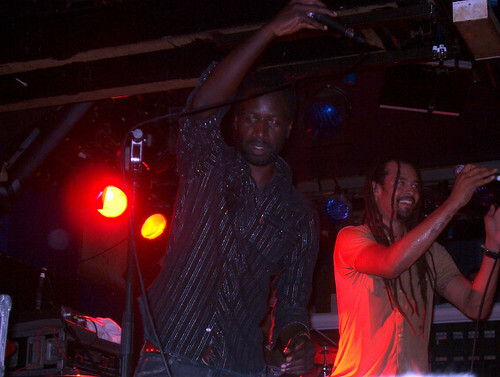 Saul Williams joined Micheal Franti and Spearhead for their gig on Sunday at the liquid rooms. Michael Franti played a two hour free acoustic set earlier in the day which he started outside of Cabaret Voltaire. Then in the evening another 2 hour set to a sold out Liquid Rooms. Joined on stage by the excellent Saul Williams. When I left the venue Michael Franti was standing in the crowd chatting to anyone that wanted to chat to him. Saul Williams Cabaret Voltaire gig the following night was another full-on show. 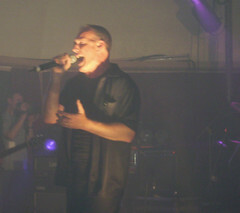 His acapella slams cemented the power of his lyrics. The following afternoon Saul did a free gig at Cabaret Voltaire, spoken word reciting his poetry. This was an excellent companion to his fast and furious set. He sat on the dge of the stage and held an open floor with the crowd. He came on at 1:25pm and at 3pm he wound things up and, like Michael Franti, stood in the audience chatting to anyone that wanted to chat. These gigs showed the breadth of Hip Hop reaches a great deal further than what the mainstream would like us to believe. Perhaps the policical nature and the questions about perception that these artists open up are far more dangerous than the rap which focuses on shootings and booty.